TheLandfall is a 26 year old, Steel Hull, 43’ Pilothouse Trawler. Captain Bob Perkins took possession of the Landfall in Daytona Beach in 2004 after a series of 3 hurricanes hit the Florida Coast that season. Following a leisure trek northward, The Landfall’s new mooring was approximately 1.5 miles from the Atlantic Ocean in the brackish waters of the Merrimac River in Massachusetts. In October of 2006, she was again on the move, this time to the sea waters of Hampton Harbor, New Hampshire. Through many years of use this ocean-going vessel was aggressively exposed to harsh salt and freshwater conditions that had adverse affects on the operation, maintenance costs, appearance and safety of The Landfall. When acquired in 2004, The Landfall had a thick buildup of bottom paint as well as corrosion and electrolysis issues. Exposure to the various elements including the warm seawaters of the Atlantic allowed the accumulation of barnacles and underwater growth, as well as the appearance of rust and corrosion. It was due to the love of this vessel and the intent to preserve her beauty that fueled Captain Perkins’ quest to save The Landfall. He determined it was Rust Bullet Products alone that could provide the restoration and preservation abilities required to save the Landfall. The Landfall surface preparation began with a soda blasting and descaling of the bottom. Rust Bullet was applied to a dry film thickness of (15 dft) on the bottom and several coats on problem areas of the side of the hull and the rubrails. There was no bottom paint applied over the Rust Bullet, as the intent was to document and verify the performance capabilities of Rust Bullet Products. As of August, 2007, the Landfall has been in the water for one year after applying Rust Bullet. There is a slight accumulation of barnacles and underwater growth below the waterline at approximately the same equivalency as other vessels at the same marina. However, unlike the coatings on the other vessels, the barnacles and underwater growths have had no visible affect on the Rust Bullet Coating. Past experience was bubbling, peeling, and rust streaks every 3 – 4 months on the rails. To date, there is so sign of bubbling, peeling, or rust streaks, not only on the rails, there is no sign of returning rust or corrosion on any surface to which Rust Bullet was applied. To quote Captain Perkins; “In all, I could not be more pleased with the performance of Rust Bullet at this juncture. At least in the areas that I can see, where I used Rust Bullet, my rust maintenance has gone from “frequent” to “none”. From the way it appears now, I expect it will be that way for years”. I did the haul out of the Landfall In the spring of last year, 2008. Since the application of Rust Bullet in 2006, Landfall had been alternately in the brackish waters of the Merrimac River, MA in the summer, and the 100% Atlantic seawater of Hampton Harbor, NH in the winter. The following is what I found on that haul out; There was quite an accumulation of mussels, seaweed, barnacles, and other marine growth on the bottom. This was to be expected in these conditions, as I had not applied bottom paint over the Rust Bullet barrier coat to see if it had any anti-fouling properties of its own. Rust Bullet is an extremely hard and tough coating, but the marine life is tenacious. I have determined bottom paint will be necessary from here on in. The Rust Bullet Coating looks like the day I finished applying it in 2006. Even the test areas where I intentionally applied Rust Bullet over existing old bottom paint, showed no sign of any deterioration. You will remember that there was a roughly 1′ X 1′ patch where the blaster had neglected to move a stand, and I just applied Rust Bullet over it with no other preparation. I was amazed that it was still in like-applied condition. It seriously looked that good. To see what the Rust Bullet looked like after that power wash, just go to my site http://www.allegiantinc.com/landfall and look at the application photos. I was very pleased and impressed, as you can imagine. I then applied standard ablative bottom paint over the Rust Bullet barrier coating, and noted no adhesion issues. It went on fine, covered perfectly, and remained so through that summer of 2008 and the extremely tough winter of 2008-2009. It is still in great shape. There is very sparse growth on the bottom, more or less sea slime and nothing serious. I don’t intend to haul her out this spring (2009), as moving to my summer dockage on the Merrimac River will put me in fresh water on outgoing tides. The fresh water tends to kill the salt water growth, and vice-versa, so I expect she’ll be as clean as a whistle. The rails that were painted in 2006 still look great; there are only a couple of small places where they will need a touch-up. I suspect this is a result of improper application of the Rust Bullet, as everywhere else looks, again, like the day it was completed. I had a friend with a working steel trawler assist me with the application of the Rust Bullet to the bottom of Landfall. A couple of years prior, he had applied a two-part epoxy to his hull as a barrier coat. He had horror stories about the epoxy setting up too soon and how he had to apply it in extremely small batches. After the completion of Landfall’s coating, he told me he wished he knew of Rust Bullet when he did his barrier coat, and that he would have used it in place of the two-part epoxy if he had. I am completely sold on Rust Bullet, and thoroughly pleased with its performance. After 3 years of being immersed in varying, extremely tough environments, I have to say that “The Landfall Project” is a complete success. 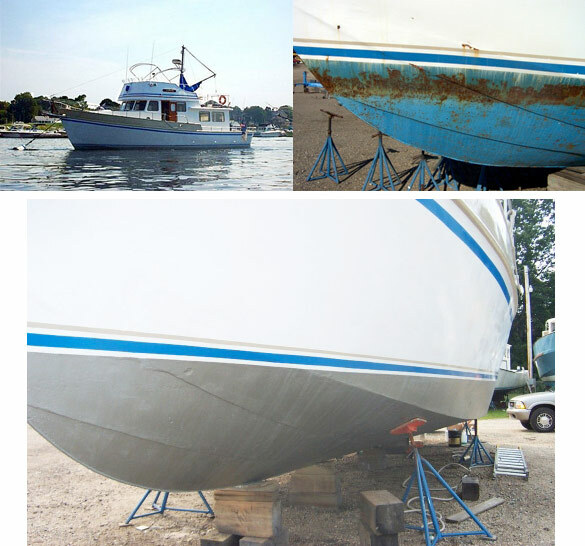 I would not hesitate to use it again as a barrier coat, and its performance above the waterline speaks for itself; you can see the results every year that the Landfall stays rust-free. I was mentioning to someone who inquired about Rust Bullet that if I were building steel boats these days, I would apply Rust Bullet inside and out before painting. I believe you would end up with an indestructible boat that would last forever. Thanks again for all your help, not to mention the Rust Bullet itself!